For many people the tasks of working with the different app stores, creating certificates, and marketing storybook apps are daunting and a hurdle for publishing. Some don’t have (or want) to spend money with membership fees, others don’t have a Mac to publish to Apple’s App Store. A great number of them don’t even plan to launch new stories. 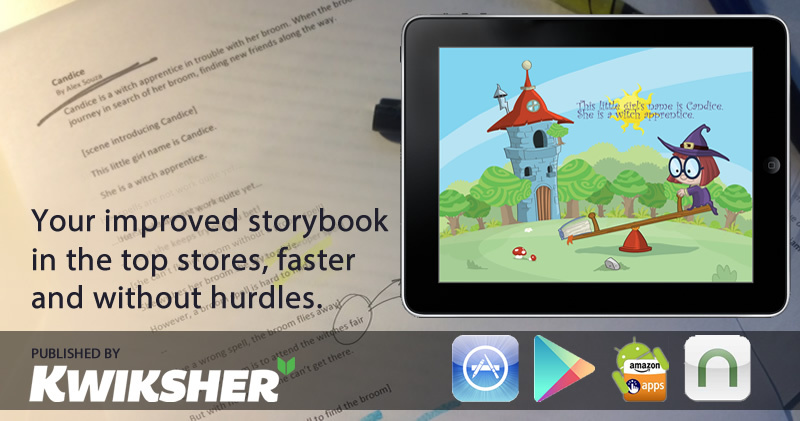 We plan to publish only storybooks that have great stories, illustrations, audio and interactivity. Unfortunately not all requests will be accepted until they reach the quality bar we are setting for all the topics above. Why the publishing service is so cheap? Part of it is because the author is creating the storybook (using Kwik). However, we will evaluate the success of this initiative and learn from the experience. Depending on the amount of work, this service price may be increased to cover all the hours involved. After all, we want the best works only. Besides creating a large library of great content made with Kwik, the revenue share is a great option to those ones willing to spend less and have more exposure. Do I keep copyright/credits of my work? Of course! Kwiksher will be name only as the publisher of the app. All other credits are from their respective owners. Can I get my story back if later I decide to publish it by myself? Yes, you can ask for the removal of your app from our catalog anytime. As we are yet working on this service, please share your questions, comments, feedback and suggestions. There is still time for changes on the process! This sounds like an effective way for children’s book writers to get published.